Fiona Bruce and the experts head to Senate House, Britain's first skyscraper. Objects brought in for scrutiny include stained-glass panels found in a skip. Browse content similar to Senate House 1. Check below for episodes and series from the same categories and more! of a building, with a unique history of learning, secrecy and Hollywood. Welcome to the nerve centre of the University of London - Senate House. of architect Charles Holden, seen here on the right. It was to be a bold, modernist statement. Holden's attention to detail was absolute. Even the drainpipes are little crafted artworks in their own right. this building has a rather sinister connection. and the wife of a certain George Orwell worked here. for the Ministry of Truth in his iconic novel 1984. "was startlingly different from any other object in sight. "300 metres into the air." and the finest academics of the day. if he'd succeeded in invading Britain. When it comes to firsts, Senate House can claim several. to admit women to its degree programmes. The Day Of The Triffids, all made use of this sky-rise location. down on the ground floor and the first floor. Shall we do that - peep into fairyland? I mean, that is absolutely amazing. How did it come to you? who they became good friends with. they became friends with his sisters. which was just the most magical moment ever. And then it was what - inherited by you or to the family? -and then my mum and then it was inherited to us. probably about another 15 to 16 of these hangings. you get more and more of a 3D effect. That very back painting also gives an illusion of further depth. As a kid, it was just magical. It still has that amazing effect now. and the depiction of fairies. It was a form of escapism. all those horrible things, you could escape into this fairyland. But let's think about who these little old ladies were. signed down here by somebody called Lilian Snelling. perhaps the greatest horticultural, botanical artist of her time. from the Royal Horticultural Society, which is their top award. She was given an MBE. Over 800 drawings and paintings. can I say, force of nature without being too punny? we're talking about £4,000, £5,000 apiece. What is a Lilian Snelling diorama going to be worth? It's a completely different audience. I think it's worth a lot. I would say £10,000 at least. -where fairies were king and queen. Well, let's have a look at what light does to stained glass. And I must say, that's a really good image. Tell us about it in your life. Well...the job I was doing, house clearances one day. In a skip, there were six of these sitting in the skip. Took them home, put them in the shed and forgot about them for six years. so we jumped on a bus this morning and here we are. These came out of an arts and crafts house. Art Nouveau and Art Deco, all that lot. arts and crafts was English Art Nouveau, sort of. And you have a look at them and you think, this is very well executed. -But it's really not bad. Basically, the colour is really nice on this. You have a lovely image. I've seen the images of the others that you have. They show the stages of man, don't they...? From a child up to old man. Start with a nurse, ends with a nurse. And here we have young man as pretty boy. -I think we have. But he's into fashion, isn't he? You have a little damage here. It come out of the skip, remember. It could have been damaged there. Sure. Well, when it comes to value, this is the best. Others not quite so much. You got six out of the skip for nothing. That's sweet as a nut, that is. -Better than working for a living, isn't it? Ink wells made out of horses' hooves are not uncommon. I've seen literally hundreds of these over the years. But this is a first because this is a famous horse. is quite literally a horse celeb. He is a warhorse of the highest calibre. -Now, there's a famous date. How come you've ended up with Lord Cardigan's horse's hoof? was a vicar in Leicestershire in the 1830s. this hoof was given to him by the Countess of Cardigan. of the Charge of the Light Brigade. and bravery is beyond comprehension, really. And, Ronald, being Lord Cardigan's steed, led the charge. and Ronald survived till 1872.
which is marked by EH Stockwell, who are very good London silversmiths. They've mounted this hoof in 1872. There are four of these hooves, as you may know. which has now come down to you. In terms of a valuation, I'm going to be quite conservative. It's got to be worth at least £5,000. I love your little collection of images here. -They're all Central line stations, aren't they? and the closest station to us, which is Tottenham Court Road. Hard to tell that in these little frames. -Who framed them all up? for the past 10, 15 years. She lives in Suffolk. so she had them framed. I've been having them in my flats in south London. Now, these were originally made in the early 20th century. So, these are well over 100 years old, each of these postcards. and he was a great graphic artist, I think. Quite simple in style, but I really, really like his style. -in the early 20th century. -finishing off the set, are you? Essentially, what you have here is £70-£100 worth of cards. is kind of more like a sort of price for them. But I hope you manage to complete the set. that's ever likely to come onto the Antiques Roadshow. This comes from the library here, of course. I know it's known as the Chandos manuscript. Well, the Chandos manuscript relates to the ownership of John Chandos. He was one of the most loyal supporters of the Black Prince. So, we're talking about the middle of the 14th century. for the Hundred Years War - Crecy, Poitiers. who was with him at these battles, recording what was happening. this beautifully illuminated bound book. which the Prince of Wales is famous for today. He was knighted. This is all part of the current Royal Family's insignia. It goes right back to the heart of chivalry. but in the storytelling. It's a bit of a spin. The spin of the Hundred Years War. In fact, it's not in English, but it is in French, isn't it? It is, because that was the language of court at the time. with a few Latin phrases thrown in. it is hardly well known at all. There is a similar version in Worcester College library in Oxford. Yes, but I'm talking about printed copies. as something that we treasure, it's almost unique. showing God the Father supporting Christ on the cross. Underneath here, this is the bit that's been thumbed most. The Prince of Wales, here. He's on his knees, dressed in a surcoat. And the Prince of Wales feathers are on either side. This is the first time the feathers had been shown. And he's saying, "Tres unum sunt." Then the "Ich dien" here. So, it's a combination of different languages and symbolism. Any contemporary would have understood this. It does take a little bit more deciphering today. But it is absolutely exquisite and beautiful. Is it the most valuable thing you think you've got? It's the biggest treasure. It is the most valuable item. It is unique. It's priceless, in many ways. To me, this is a priceless item. But, for insurance purposes, £2 million. I think it would be worth twice that - £4 million. it's great for me to come back to London and see a London pot. Made by the Doulton factory in Lambeth. and all sorts of wonderful creatures. She was a wonderful lady, who owned all these animals. -She had her own zoo. but you can get kangaroos and all sorts of things by her! I think she's a wonderful woman. Had this incredible ability to incise and draw these horses. I think they're terrific things. -They're so lifelike, aren't they? It's basically called a loving cup. and everybody can take a handle and drink from one side of it. It goes back a long way, these loving cups. And, um, I think it's absolutely wonderful. Have you had it a long time? I was at an auction about nine months ago and I saw this. I couldn't afford to buy anything really decent. And I saw this and I thought, "I really must have it." This one... Yes, there we are. How old would she be then, when she did that? She'd be in her twenties then. She came from the Lambeth School of Art. -in recent years, I don't know why. But one day she'll boost up again. would have been something like £1,000. Now down, possibly, to about £500. But it's still a jolly fine pot. -I love it very much. I'm sure you do. It's a real statement, isn't it? we've ever had on the show. perhaps the best-known British warship of all times. You must live in a pretty large house to accommodate this. It lives with us in our main room. and we sort of forget it's there half the time, really. We have to be careful that we don't get too close to it. and your wife stood behind you. -And it's amazing it's still in one piece, really. but you have all the gun deck detail and cannons. -When did it first come to you? who acquired it originally in the late '90s. -And it came to him from a dealer on the coast in Emsworth. for a boat he was selling to this chap. So, it was cash and this boat as well. OK. A bit of wheeling and dealing. the fundraising tour organised by WL Wyllie, in the 1920s. just a few miles from here. One of the greatest of naval and maritime painters. as a national icon and that the ship should be saved. and raising funds to make a start. I think the restoration started in 1922 and took seven years. But, I mean, it's ongoing, isn't it? -in a lemon yellow and grey colour. William Lionel Wyllie's attempt to raise the funds worked. It was saved for the nation. would look like on completion. In fact, what took me was the detail of the rigging. There's no sails on this particular model. for the restorers to get the rigging precise. -That was part of the purpose of this model. fairy lights - and a few small baubles, bit of tinsel. Instead of getting a tree, sometimes, you know. Great. It obviously is a ship that earns its keep in your household. it's worth... And it is limited by size, I'll be honest. Smaller ships could make more sometimes. -Value, at auction, £1,500, £2,500, that sort of area. Really, you have got a very lovely fan. 1780, 1790, this sort of period. So, this is something you've acquired recently? Yes, quite recently, a couple of months or so. -that I'm trying to launch. so I thought, "Why not buy and sell antiques?" I love that. I love the kind of beautiful objects from the past. It's good. I don't know what it cost you. I shouldn't go into fashion at all. You're going to do rather better, I think! He's got an amazing eye. Just a really jolly day out. with musical instruments, floral swags. It really is a really romantic piece. Value-wise, they are slightly tricky. But it's upper hundreds. Is it towards £1,000? £800, £1,000 - is it a little over that? That sort of region, really. It's got everything somebody would really like to own in a fan, really. This is such a celebration of colour. And I see that it's signed "Nolan." who's obviously Australia's greatest 20th-century artist. Can you tell us how it came to be yours? In 1987, I was a young company manager at the Royal Opera House. to come and design the sets. about where does this fit in to the set design? and three other backdrops and this is one of them. because we ran out of money and didn't have enough to realise them all. because it wasn't actually in the show in the end. this design has ever been unveiled to the world on camera. who is this Australian outlaw. that series was at the heart of the whole exhibition. a really very different side. He designed many sets for the Royal Opera House. -it's a water-based paint, but he's actually used spray paint. in changing, using different materials, using different paints. he actually painted using Ripolin, which is just a household paint. What I love about this piece, though, is the history. Knowing it's for a set design, so he designed it to be huge. But actually, on this scale, it works remarkably well. I'd suggest an estimate in the region of £1,200 to £1,800. because it was something that he gave to me. Talk about decadent. Talk about amazing. -and you guys are dressed so appropriately. You clearly know where to find fabulous accessories. to actually appreciate the sort of things she collected. She collected a lot of bits and pieces. And so it ended up with me because I deserve it, I think. obviously find their way to you. -It's a very rare thing. jewellery, just like you've described. all in the Renaissance style. That's what this fits into. with the crescent on there. And it's got a little jewel in his turban. The face is enamelled in black with earrings. It's so complete. It's like a miniature pipe. carved in the forms of Blackamoors and other subject matter. But this is a miniature pipe. In silvergilt. This was gilt once. The gilt has worn off because you've smoked so much with it. which was typical again of Austro-Hungarian work. would make at least £1,500. that's been brought in on the series for me. It is such a beautiful glass. before going any further. How do you know it? OK. What did he do? OK. What do you think of it yourself? How do you see it? I love it. I love the engraving on it. dates from 1740, or thereabouts. So, it's 260, 270 years old. to a degree of complex, rococo-style scrolls. where you have... The glass is smothered. It's called Laub und Bandelwerk, which is framed. You have trellises and it's all interconnected. And the quality of the engraving ranges through the glass. is very high quality indeed. But what surrounds it is not quite as good. and others would paint the backgrounds. That's what's happened here. You've got two qualities. "so let me give you this glass as an expression of my thoughts." He knew what he was doing. This wasn't an accident. This is somebody saying, "Thank you very much indeed." And isn't that an eloquent...? If you get it, it makes it a much more valuable item. because he's going to be so chuffed. but it's also kind of 600 quid's worth of value, too. So, can I come and be a fly on the wall when you tell him tonight? I will. Thank you very much. to be explaining your own possessions to you! Lovely! It's time for this week's Enigma. we've actually had a little help from a friend, Henry Sandon. Fergus Gambon is here to tell us about our mystery item. This is Henry's. He brought it in just for our delectation today. because it looks a bit like one but that's too obvious. So, what suggestions have you got? It's a gravy boat. I don't know what the problem is. -It's not a gravy boat! What else could it be? It's a gravy boat. More specifically, it's a gravy boat for soy sauce. when they couldn't get the real thing. have a special kind of gravy boat? The truth of the matter is, I really don't know. are very open in their shape. without the need for a cover is what this is all about. OK. So, a fancy type of gravy boat. It's a communal drinking vessel. And how would such be used? through history, is they've drunk together. -Like that, or from the side. -How could you drink from the side? The fact it's folded over means it would go everywhere. Again, it's not totally certain. But I think, you pick it up like that, and you do it like this. So, what's your third offer? -Your final and best offer? is that it's a lady's portable urinal. -And 18th-century she-wee, that's right. How would that be used, then? This should be obvious to me. I'm not the best equipped to demonstrate, I'm afraid. So, why would it be needed instead of a retiring room, a kind of loo? they had to sit or stand for a long time and they got caught short. -So, a fancy gravy boat for soy sauce or the equivalent. Though it must be quite a messy one. Or a portable female urinal contraption thingamajig. OK, what we do we think? Chaps, I'm going to leave you out of this for a minute. Ladies, what do we think? Hands up for the gravy boat thing. OK. A few for the gravy boat. Do you know, I'm going for that. Because, apart from anything else, the shape, Fergus. it just lends itself so beautifully, I would say. passing it to some hapless and very unfortunate flunky. We're going for the female urinal? No, it is. That's what it is. And it has a very, very poncy name. in a lovely country house. And there, on the table, was one of those. The occupants of the house had no idea. So, he had his food, minus gravy. We actually think it belonged to my grandmother. She was a Lady Mayoress there in the '50s, and she was a great collector. After my father died, we found this amongst his archive. but we just came across these and hadn't been aware of them. Interesting. So, she'd never showed the book to you in her lifetime. -Well, it certainly seems it. would have been published in. It's by this lady, Lydia Byam. -She came from a big family on Antigua. there's a little bit of confusion about sometimes which one it is. as it says. It says printed at the Oriental Press for the author. So, done in a very, very small number of copies. produced with aquatint, all done by hand. must have been quite stunning in those days. -There are supposed to be nine of these in the book. -No idea where it is? -but, no, we don't know. -Because it's a very rare book. It doesn't come up very often for sale on the market. I couldn't find any copies available at the moment. So, that means it's rare. -somewhere around £10,000 for it. Despite that, it's still, I think, an estimate of £4,000 to £6,000. -It's a really, really rare thing. for books about the West Indies. which are very, very obscure and difficult to come by. -But it's a lovely thing. Thank you very much indeed. the most unusually-known sports I've ever come across. Perhaps you can tell me, rather than me trip over my words. It's a style of wrestling called catch as catch can. but other areas did have it as well. And this is your grandfather, I believe? Wearing this very belt, which he was presented in 1905. -And the belt's 1904, so that kind of makes sense. -I gather your father also participated. Yes. He joined a gymnasium in Manchester run by my grandfather. with a view to entering the 1916 Olympics. so that put an end to his active wrestling career. But he became a referee. And this is a picture of him. -He did a lot of refereeing. He was a referee at the 1924 Olympics in Paris. Wow! He must've been a good referee. -you get to the Olympics as a referee. Now, this belt is the silver belt of a World Champion. something I've been dying to do all day. Not that I'm ever going to win the belt of a World Champion. ..I can feel like it for a minute or two. Better pop it back before I get delusions of grandeur. And there we are. So, this is a gorgeous belt. The five plaques are made of solid silver. They're all marked for London 1904. I gather this bowl, you think, was bought with his wrestling winnings. Could well have been, yes. This bowl is today worth about £3,000. That is as a surprise. wrestling than he was, presumably, on applied art and silverware. when we see this vase. and the other is Liberty. And, lo and behold, yours has got both of them on. Well, it was my mother's. except that it's possible it was given to her by one of her admirers. it's already been an expensive piece of pottery. It's a very hard technique to do. If you fire it too much, all the design disappears. But if you fire it perfectly, it's wonderful. but it's a lovely shape. The pattern, the tree landscape, everything works together. they'd be giving me £2,000. I never know what I'm going to be confronted with. it's always an absolute joy. We've got this amazing, carved, little, wooden object. -You have no idea at all. -OK. Well, I'm not going to tell you for a minute. What I want to know is, where did you get it from? Well, it belongs to my father-in-law and he got it from a family friend. And, beyond that, we know nothing at all. You know nothing at all? You must have admired it as an object. -It really is beautiful, isn't it? Actually, what it is is a knitting sheath. a needle in the end of it here. because it is absolutely, exquisitely carved. that set of initials there. That looks like an IB. Had you ever noticed another inscription? There is a number at the end of it. because you can construe it in a couple of ways, can't you? But I'm going to construe it as the date 1749. Look at some of the detail on here! We've got these really incredible little figures. In fact, actually, they look much older, don't they? They look Elizabethan, almost. Figures with fans. We've got some zoomorphic sort of creatures there. What appears to be a lizard, perhaps, and some snakes. perhaps by a gentleman for his sweetheart. Now, if we look at this section here, we've got a seal. And it's a dove with an olive branch. Now, that should have been connected to that bit with a wooden chain. And the wooden chain has gone missing. that I can kind of put up with that, really. But it is really very beautiful piece of folk art. -I think this is probably cherrywood. Look at the way it has acquired that colour, that patination. as good on the Roadshow again. -Let's think about the valuation on it. this would more than likely make round about £2,000 to £3,000. -It is astonishing, really, isn't it? so I presume it wasn't yours. So, how have you got it now? Well, this watch originally belonged to my great-grandfather. -Have you ever worn it? Do you use it? I think it's too precious, so I just keep it on the side. OK, it's a Bulova Accutron. They first came on the market in October 1960. And this was the first electronic wrist watch. it was very much the first full-blown electric wristwatch. which was a great deal of money in the 1960s. Production ceased in about '75, '76, having sold 5 million. and the liquid crystal display of the digital dial. compared to a normal watch? It doesn't have a watch face. is what Bulova referred to as the space view. and, particularly, the little tuning-fork device. What is lovely, it's got an original Bulova strap. -when I tell you it's not a high-value item. And condition is so important. There's slight scratching on this dial, on the glass. I'm going to say, in that state, about £300. It's still nice, you're absolutely right. -..it's not bad at all, is it? We're used to musical chairs, but musical plates? It was bought by my late husband. He passed an antique shop and he saw it. -But the whole style is in the same genre. up in the top north-east corner of France. printed plates of the mid-19th century and beyond. So this is actually quite a revolutionary technique. -But the other thing is, there's a sense of humour about this. -I'm hoping there are musicians in your family. Oh, Peking Opera! Oh, no. Yeah. Well, that's a noise I do not want to replicate. in a well-known duet for sopranos, where they sing like cats. -cats forming the notes of this piece of music. Yes? It's in 6/8 time. Well, it's very much in that satirical vein. -I have to tell you. -So, these are beautifully printed. At the centre of each, there is a conductor. I think there's a touch of the Franz Liszt about him. He has that wild look. We go through all the various movements and styles of music. So, we start off "in dolce", which means sweetly. and "largo", which is slow. Well, it is sadness, you're absolutely right. Cos the only broken plate is the last movement. it's the last one to go. Probably somewhere between 1850 and 1870. A very, very nice set. Very rare. Transfer printing in colours. I suppose we ought to compose some sort of a value for you. they might pay in the region of £300 to £500 for them. when they put the cats on the staves, goes something like this. Now, how did it come to you? I inherited it from my mother-in-law. It was bought to her by her husband, who may have got it in an auction. so he may have purchased it anywhere on his travels. And, were you startled when you saw it? Yeah. I was startled that it was going to come to me. but I think there's another ghost here. shot with green and blue silk. and chooses, or at least hints, that that's what she wants. And then her husband comes along and says he's going to buy it for her. the last-gasp of luxury at that level, really. We never saw it again after the Second World War. and we don't know this ghost. This may be the only evidence we can ever hope to claw her back. mainly brilliants, and square-cut diamonds here. -That implies it's made between 1927 and the early 1930s. but also to Chinese works of art. And they lie here with these circular discs. that we see in the greatest jewellery houses of the world. to attribute it to such a jewellery house. It's combined with very rich, intrinsic value. We have six, considerably large, brilliant diamonds in here. of art and intrinsic value. because this is what everybody wants. It's of a scale that everybody wants. It's enviable, and with all of that comes huge excitement. I don't know about you, but I'm nearly fainting. over a number of Parisian jewellers. or particularly Boucheron, who I sense actually made this jewel. Unfortunately, I can't make any sense of that. but we can see it's of the finest possible quality. you would have to pay £150,000. Oh, darling! We're both going to cry. I could buy a Bentley now. Set me off now, you silly old thing. That was a really emotional moment, wasn't it? That lady clearly wasn't expecting that valuation at all. 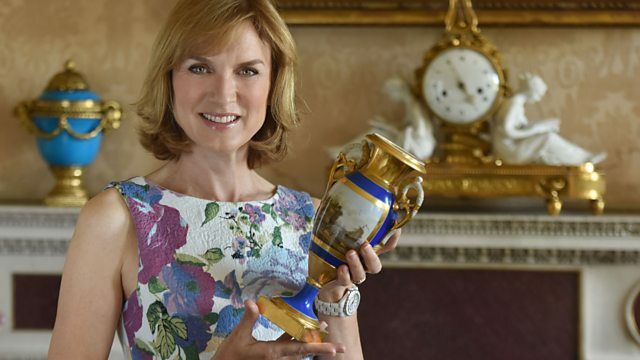 So, we love to see you on the Antiques Roadshow. From all of us here at Senate House in London, until next time, bye-bye.